Pit pop is probably not a genre you’ve heard of before. 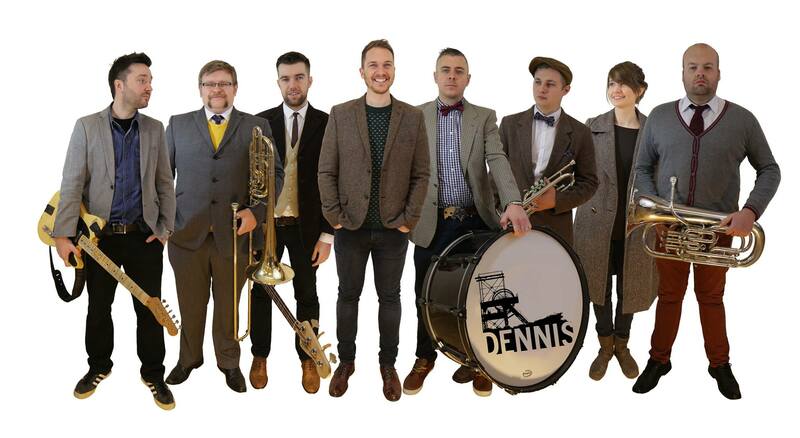 Dubbed as such by a local newspaper, the label has stuck for 8-piece folk-rockers Dennis, whose songs feature heavy brass elements and lyrics referencing the working class towns where they grew up. They duly enlisted four pals from the local brass band: “Most of us are in it already. I play trombone. Stuart, the drummer and Hannah, the keyboard player, they play tenor horn. We’ve all been mates since primary school. Everybody’s confident performing because we’ve been standing up doing solos in brass bands for years and years.” One track led to a whole EP, 2012’s Colliery Welfare, and two releases later, it’s their trademark sound. New EP, The Caroline, takes things further, with songs featuring a higher brass quotient than ever before. Tracks Lifeline and Move Too Soon continue in the vein of the upbeat melodies which have gained them recognition, while All This Time takes a slower tempo and more ballad-esque approach, with tenor horn player Hannah providing secondary vocals for the first time. They’re a multi-talented bunch, and they’re not afraid to switch things round a bit. Dennis release The Caroline via Sapien Records on Monday 1st December. The band play Arts Centre, Washington on Friday 28th November.